1. 1. In medium bowl, toss strawberries with granulated sugar and water. If not serving right away, cover and refrigerate up to 4 hours. 2. Prepare outdoor grill for direct grilling over medium heat. In medium bowl, stir together cream cheese, powdered sugar and vanilla extract until smooth. 3. Slice pound cake crosswise into 8 equal slices. Evenly spread cream cheese mixture on 1 side of 4 slices of cake. Place remaining 4 slices over cream cheese mixture to close sandwiches. Lightly spray outsides of sandwiches with nonstick cooking spray. 4. 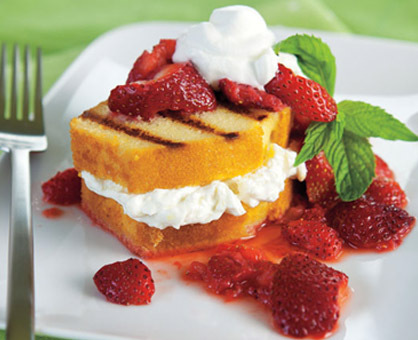 Grill pound cake sandwiches 3 to 4 minutes or until grill marks appear, turning once halfway through cooking. Serve topped with strawberry mixture and whipped topping; garnish with mint leaves, if desired. Pound cake sandwiches can also be grilled on a grill pan.